Trainer Danny O’Brien on Wednesday morning slammed the judicial process that saw him disqualified for four years, claiming he was looking forward to when his future appeal against his cobalt sanction will be ‘examined properly in a real adult court’. O’Brien spoke to the media moments after the Racing Appeals and Disciplinary Board announced his penalty over four charges related to cobalt administration. Fellow Flemington trainer Mark Kavanagh received a three-year disqualification while the vet at the centre of the cobalt saga, Dr Tom Brennan, was disqualified for five years. Instead of being deflated by the massive penalties, O’Brien said he and Kavanagh were looking forward into 2016 with confidence that they can clear their names when their appeal is eventually heard at the Victorian Civil and Administrative Tribunal. “We are really pleased to get this part of the process behind us,” O’Brien told a media pack after the penalties were announced. “Obviously, it has been a long 12 months and certainly some of the process has been less than satisfactory. O’Brien and Kavanagh were granted an immediate stay of proceedings by VCAT on Wednesday afternoon, so as to permit their horses to start at Wednesday afternoon’s Geelong meeting. O’Brien said despite the RAD Board’s findings, there were plenty of unanswered questions. “You’ll all be aware that we’ve raised some real issues with how this scenario has played out over the last 12 months before Christmas there,” he said. “We still haven’t had any answers from RVL. The chief integrity officer has gone missing for I believe it will be seven weeks when he supposedly comes back on the first of February. 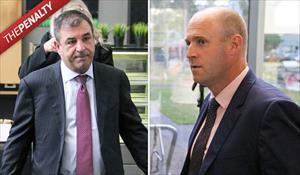 O’Brien was furious at the initial hearing in December when his legal representative was not permitted to cross-examine Racing Victoria’s chief steward Terry Bailey nor integrity officer Dion Villella over aspects of the investigation. In announcing the penalties, board chairman Russel Lewis stated that the trainers’ breach of Australian Racing Rule 175 (h) (i) - which deals with administration of a prohibited substance - is the most serious offence in the rules of racing. He said that although the penalties for the breaches were mandatory in that they evoke a minimum three-year disqualification, where there were multiple offences, the board took into account the principles of proportionality and commonalty. He said that, in relation to O’Brien, he was disqualified for three years in relation to the positive swab from Caravan Rolls On and that four months of the penalties imposed in relation to his other three horses - Bondeiger, De Little Engine and Bullpit - were to be served cumulatively, meaning he would serve a four-year term of disqualification. Kavanagh, who had just the one administration charge involved his horse Magicool, was given the minimum mandatory sentence of three years. As for Dr Brennan, he was disqualified for three years in relation to the positive of Caravan Rolls On and that six months of the penalties imposed in relation to the other four cobalt horses were to be served cumulatively, meaning he would serve a five-year term of disqualification. Lewis later varied the penalty for Brennan following a successful submission by the vet’s legal representative Adrian Anderson that Brennan’s penalty should be backdated to August 1 of last year, as that was when the vet stood himself down from his practice pending the cobalt hearings.